Is it Possible to Overdose on Nicotine by Vaping With an E-Cigarette? Numerous sources will tell you that nicotine is three times as poisonous as arsenic, and that it only takes 60 mg to kill an adult, but is it really something vapers need to be concerned about? Could you vape your way to a fatal nicotine overdose? Or would you have to possess a superhuman pair of lungs and be vaping high-strength nicotine base through a fog machine to even stand a chance? With the recent study investigating the nicotine delivery from first generation and new generation devices and some updated information regarding the toxicity of nicotine, it’s possible to make a tentative estimate of just how much chance there is you can overdose on nicotine through vaping. The 60 mg figure (or even as low as 30 mg) for the dose of nicotine that has a 50 percent chance of killing a human is still quoted by numerous sources and can be found in a wide range of text books, but it’s probably just plain wrong. Bernd Mayer investigated the source of the claim and eventually found his way to an old text book containing a fairly speculative paragraph based on some experiments conducted in the nineteenth century. The basic procedure involved the experimenters giving themselves between 1 to 4 mg of nicotine and documenting the effects. Along with things like increased salivation, nausea and vomiting that are to be expected from nicotine poisoning, the experimenters reported seizures and loss of consciousness. The problem is, 4 mg of nicotine is the equivalent of smoking around two cigarettes, and if seizures and loss of consciousness were common from this small a dosage, smoking areas would be quite literally littered with convulsing smokers. So, that is the source of the 60 mg estimation for the toxic dose, which has been fairly unthinkingly repeated ever since. 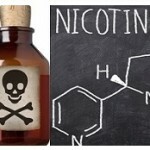 Mayer estimates (based on reported plasma nicotine concentrations from people who did die from a nicotine overdose, as well as large doses that people have survived) that the true toxic dose is more likely to be between 500 mg and 1000 mg for an average sized adult, corresponding to a dose of 6.5 to 13 mg/kg. In terms of plasma concentration, the old estimate would have been 0.18 mg/L and the new estimate is 4 mg/L. How Much Nicotine do Vapers Absorb? The only other thing we need to know to make an estimate of how likely it is for vapers to suffer a nicotine overdose is how much nicotine we actually get from vaping. The study from Dr. Konstantinos Farsalinos mentioned earlier, comparing the nicotine delivery from first generation e-cigs in comparison to mods, provides this information for ten puffs taken over the course of five minutes. For the higher-powered mod, the plasma nicotine level reached 6.59 ng/ml, or (converted to mass per liter) 6.59 μg/L, after 10 puffs of an 18 mg/ml liquid in five minutes. A μg is a microgram, which is 1/1000 of a milligram (mg), and from this point alone (bearing in mind Mayer’s estimate of 4 mg/L for toxic dose) it should be quite clear that an overdose on nicotine through vaping is highly implausible. So How Much Would You Have to Vape to Overdose? If we simplify matters a little by assuming that 20 puffs of an 18 mg liquid produces twice the plasma nicotine concentration 10 puffs would, 40 puffs produces four times the concentration and so on, we can make an estimation of just how much you’d need to vape to overdose. The assumption that it would increase at the same rate is unrealistic (from the study you can clearly see the rate of increase getting smaller during the “ad-lib” usage period), so will undoubtedly result in an underestimation of the true value, but it illustrates the lack of an issue very clearly. Given that 4 mg/L is 4000 μg/L, the plasma nicotine concentration from 10 puffs over the course of five minutes is 607 times lower than a lethal dose. Since we’re drastically simplifying, we can just assume that you’d need to take those 10 puffs 607 times to approach fatal nicotine levels, so 6,070 puffs. If you took this many puffs over the course of a week, it would equate to over 860 per day, and to consume 6,070 puffs in 24 consecutive hours you’d need to take around four puffs a minute (without sleeping, that is). If we were to use the current estimate of 60 mg as a toxic dose of nicotine, which is 0.18 mg/L (180 μg/L) plasma nicotine, it would take around 273 puffs to overdose. This is at least more feasible in terms of actually inhaling that much – and is around the amount of puffs vapers have per day – but still hardly presents a risk. The big problem is that nicotine has a half-life of around 2 hours, meaning that within two hours, half of the nicotine consumed will have been metabolized into cotinine. Therefore, to realistically overdose you’d need to be consuming the toxic amount within an hour, and even then some of it will have been turned into cotinine by the body. For the lower dose, that would be four and a half puffs per minute for the whole hour. So, taking into account that you’d have to do it quickly and using the larger, likely much more accurate nicotine toxicity estimate, you’d need to have 6,070 puffs in about an hour, or over 100 puffs per minute. In other words, it’s not really possible. If you were vaping some strong 36 mg/ml juice (and assuming this creates twice the blood nicotine levels 18 mg/ml juice does), then it’d be 50 puffs a minute. Given that the average puff length is about 4 seconds, there just isn’t enough time in a minute to even approach that number. And that’s before you even consider the mounting, highly unpleasant side effects that would occur. You’d have to be one dedicated vaper to keep going through vomiting, nausea, stomach pain and more. Is Nicotine Poisoning Nothing to Worry About, Then? Granted, it would be highly unlikely that you would vape your way to an overdose (barring the superhuman lung, high-strength nicotine juice vaped from a fog machine scenario), but that doesn’t mean that nicotine poisoning is no concern at all. If you have a 30 ml bottle of 18 mg e-liquid, that’s 540 mg in total, which is at the lower end of the revised toxic dose for adults. If you act like an idiot and drink it, you may have a very, very bad time indeed. Additionally, nicotine can be absorbed through the skin, so if you were to spill e-liquid (especially high-strength nicotine used for DIY mixing) on yourself, then again there is a very real chance that it could be fatal. That’s why you have to not act like an idiot when you’re dealing with nicotine. However, any concern about nicotine overdose in vapers – outside of the e-liquid spillage/chugging competition situations – is strongly misplaced. For children or pets, the concern is more justified (less weight means less nicotine for a fatal dose), but for us consenting, sensible adult users, nicotine overdose through vaping is effectively impossible.